I did custom quilting on this Gravity quilt for a customer. I was pretty happy with the result and my customer was delighted. I found this pattern a few months ago and immediately began searching for the fabrics i wanted to use. Once they all arrived I started piecing, piecing, piecing. I loved the top when it was completed but it took me a very long time to come up with a quilting plan. I had a week off from working on customers’ quilts just before the holidays and I took a deep breath and put it on the frame. Oh, did I have fun. It took me several days to work out the placement and stitching but I am pretty happy with the result. I love modern quilting. In this case it adds movement to a fairly simple quilt. My customer used minkee on the back which is not only very soft but beautifully showcases the quilting design. I made this quilt from a Missouri Star pattern and I loved its bright cheerful quality and thought I would enter it in our guild quilt show. 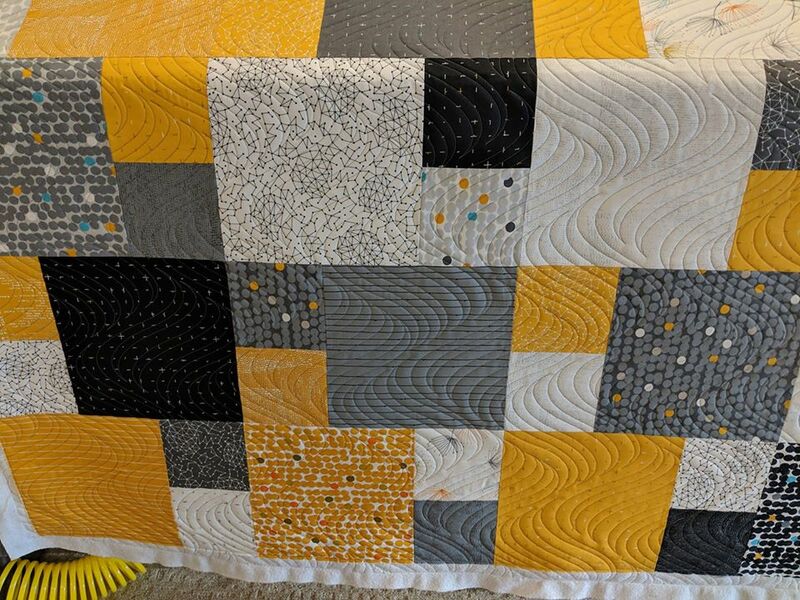 Once I had it quilted and bound I hung it up so I could inspect it for wayward threads and much to my surprise I realized one triangle was turned the wrong way. I had a good laugh and named it Oopsie Daisy. I guess the judges had a good laugh too and awarded it a ribbon. 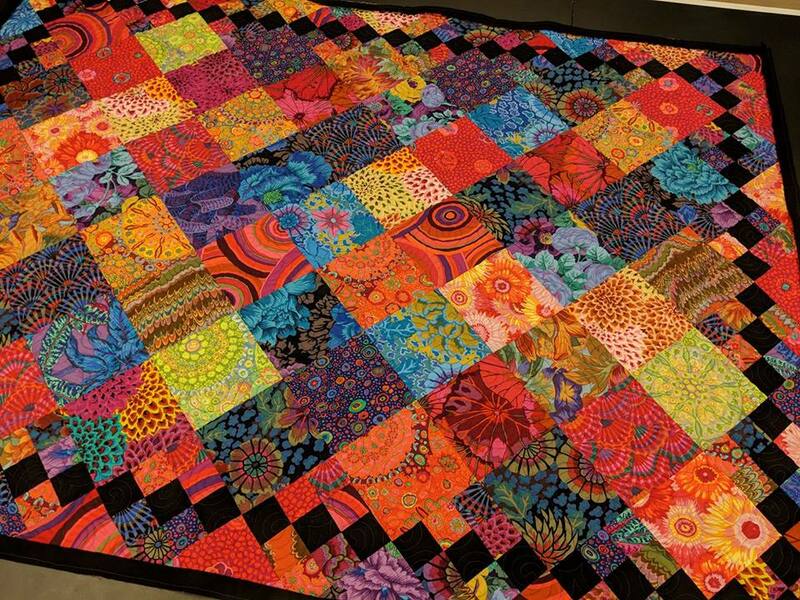 Some K Fassett quilts overwhelm me with too many patterns and too little contrast. This quilt, however, has such a beautiful balance and the nine patches with the black squares are the perfect frame. This is a client quilt I don't want to leave my studio. 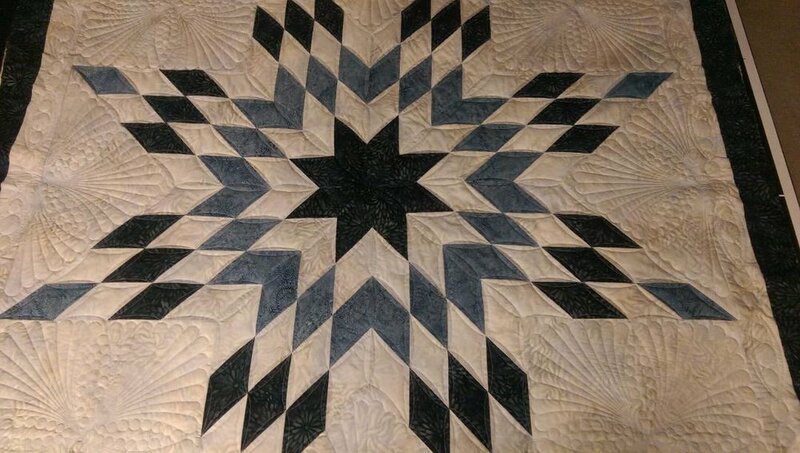 This beautiful Lone Star quilt was used as a fundraiser for a local animal shelter. The customer designed and created it without a pattern. I love doing custom quilting so this quilt was just plain fun for me. This is Lily, my labradoodle and my quilting helper today. It's more fun to quilt with a friend but sometimes my "friend" wants to lay on the anti-fatigue mat. She finds if she chooses to lie under the frame she doesn't get stepped on. This darling doggie quilt is for a customer who does Airdale rescues. She chose paw print minkee for the back. This really is puppy love.